Joiningthedots.tv Independent Film For Independent People Tim Sparke Mercury Media Presented to AIDC February 21st 2008. 2 Background December 2006 Study shows 0.1% of weekly UK prime-time programming is acquired documentary Loose Change 2 attracts 4 million viewers on google video Idea for documentary portal begins to form - based around independently sourced film and combined with existing print offerings. Clear interest in docs online yet broadcaster reluctance to support genre on TV. 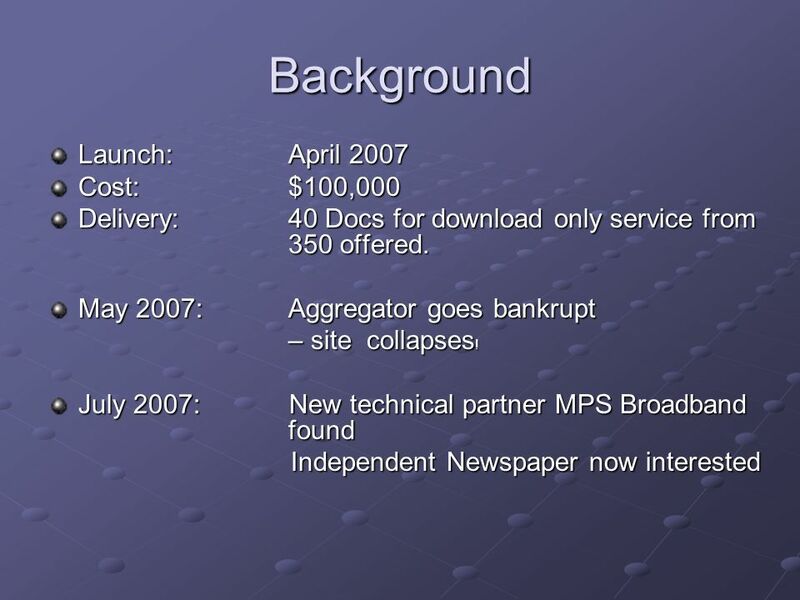 5 Today February 2008 – Soft launch of new service.February 2008 – Soft launch of new service. Offering 50+ films with 100 new films including Oscar winners and nominees in process of coming on stream.Offering 50+ films with 100 new films including Oscar winners and nominees in process of coming on stream. Independent service to launch Spring 2008 melding on- line journalism with documentary.Independent service to launch Spring 2008 melding on- line journalism with documentary. Significant marketing budget support contracted.Significant marketing budget support contracted. Agreement with major Movie House to launch 1 film per month from site theatrically in the UK.Agreement with major Movie House to launch 1 film per month from site theatrically in the UK. 6 What Are We Looking For? Author Driven Docs with a point of view that fit into any one of our eight strands. Outstanding production values coupled with great storytelling. No subject off limits Ideal length 50 - 100 minutes. Delivered in DVD format. Non-exclusive streaming and download rights + download to burn rights in future. Can accept territory exclusions as site can be geo filtered/blocked but must be available for most countries – we are a world-wide site! Realistic expectations from producers and distributors..
7 What Do We Offer? 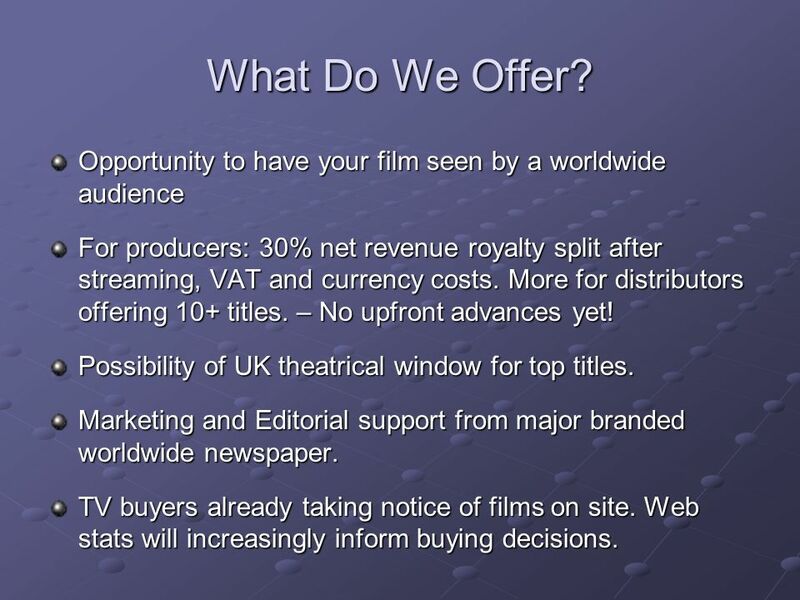 Opportunity to have your film seen by a worldwide audience For producers: 30% net revenue royalty split after streaming, VAT and currency costs. More for distributors offering 10+ titles. – No upfront advances yet! Possibility of UK theatrical window for top titles. Marketing and Editorial support from major branded worldwide newspaper. TV buyers already taking notice of films on site. Web stats will increasingly inform buying decisions. 8 Audience Opportunity A haven away from Big Media. A club for doc lovers. A haven away from Big Media. A club for doc lovers. Great films made by great film-makers. List of producers/distributors already committed reads like a whos who of documentary film. Great films made by great film-makers. List of producers/distributors already committed reads like a whos who of documentary film. Off limits subjects available 24/7. An online film festival. Off limits subjects available 24/7. An online film festival. 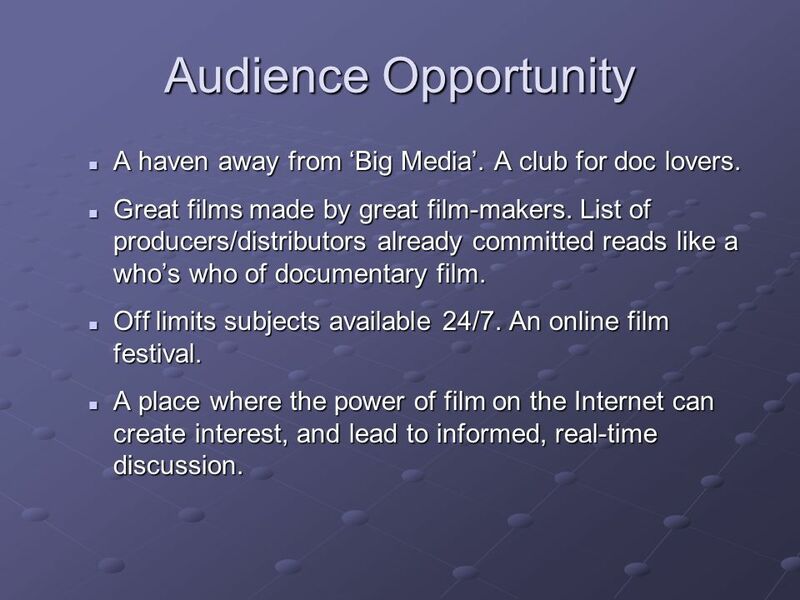 A place where the power of film on the Internet can create interest, and lead to informed, real-time discussion. A place where the power of film on the Internet can create interest, and lead to informed, real-time discussion. 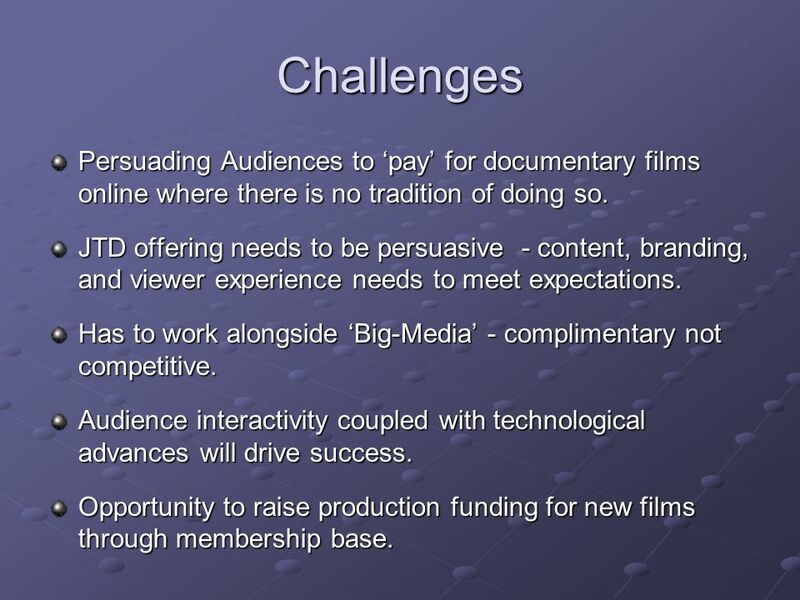 9 Challenges Persuading Audiences to pay for documentary films online where there is no tradition of doing so. JTD offering needs to be persuasive - content, branding, and viewer experience needs to meet expectations. Has to work alongside Big-Media - complimentary not competitive. Audience interactivity coupled with technological advances will drive success. Opportunity to raise production funding for new films through membership base. 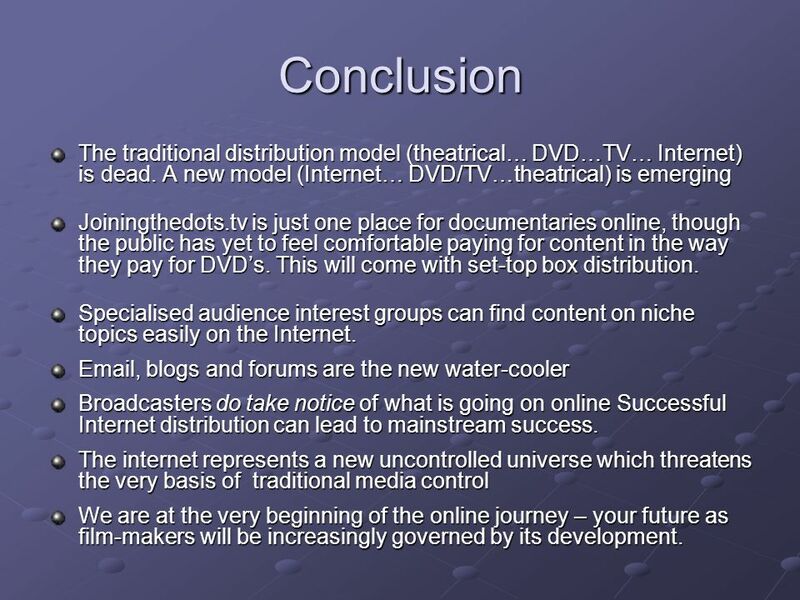 10 Conclusion The traditional distribution model (theatrical… DVD…TV… Internet) is dead. A new model (Internet… DVD/TV…theatrical) is emerging Joiningthedots.tv is just one place for documentaries online, though the public has yet to feel comfortable paying for content in the way they pay for DVDs. This will come with set-top box distribution. Specialised audience interest groups can find content on niche topics easily on the Internet. Email, blogs and forums are the new water-cooler Broadcasters do take notice of what is going on online Successful Internet distribution can lead to mainstream success. The internet represents a new uncontrolled universe which threatens the very basis of traditional media control We are at the very beginning of the online journey – your future as film-makers will be increasingly governed by its development. 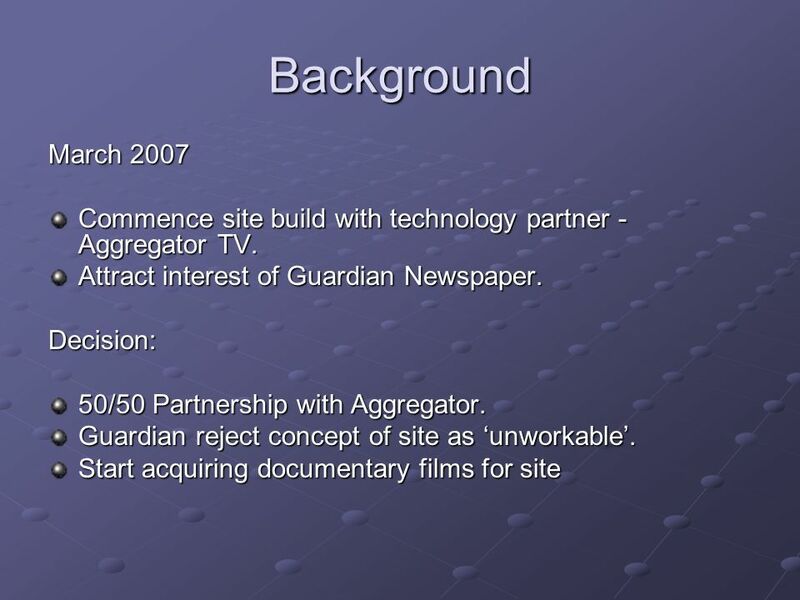 Download ppt "Joiningthedots.tv Independent Film For Independent People Tim Sparke Mercury Media Presented to AIDC February 21st 2008." Future of Video Games September 2008 Shana Fisher Senior Vice President, Mergers & Acquisitions, Strategy IAC/InterActiveCorp. Brief Introduction AD Europe: the number 1 in Europe 160 million European onliners in 30 countries The central media marketeer in the European online. MTV Staying Alive Ignite A Pilot Project. About MTV Staying Alive // Global: MTV is a global media and general entertainment company with young people. Advertising in Distributed Content Markets. Topics I.Online advertising and video growing dramatically II.Big Flies in the Ointment III.Advertising Models. Web Streaming Solution DIGIMELD GRID-STREAMING SOLUTIONS Copyright © 2008 DigiMeld, Inc.
1Abacast - Confidential1 Hybrid Content Delivery Network (CDN) Technologies and Services. SPI INTERNATIONAL FULL SERVICE FILM COMPANY. 1Q2009 SPI group DISTRIBUTION - CINEMA & DVD & VOD – major buyer and distributor of independent movies in. WAG Publishing Traditional, Self Publish & Print On Demand Publishing Business Models. 1. 2 The Global opportunity– Why, where and how to geographically expand your affiliate programme James Maley, Head of Corporate Clients, North West Tradedoubler. Newspapers drive web traffic 1 Summary of effectiveness test findings. Acquiring rights from the author: key aspects of the author- publisher contract Lynette Owen, Copyright Director, Pearson Education Ltd, United Kingdom. Clearing and Licensing VOD Right Estoril 2008 – – Philippe Leconte.